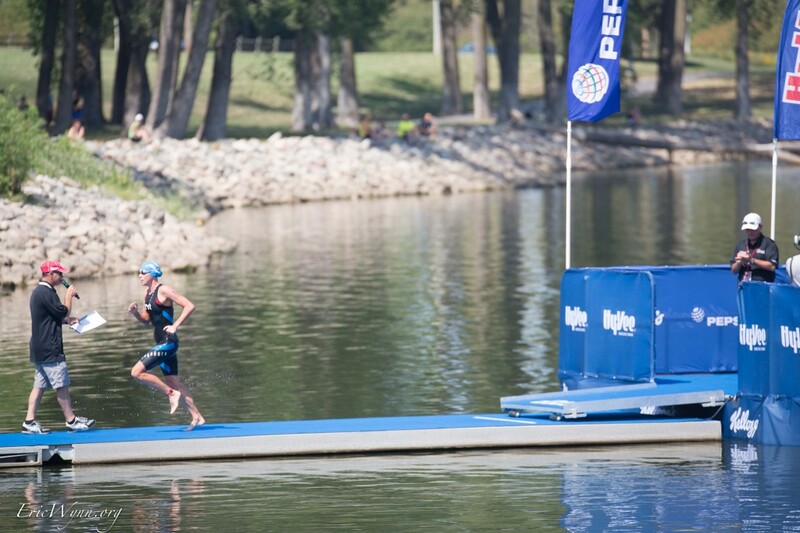 This Labor Day Weekend, Des Moines hosted the Hy-Vee Triathlon. Hy-Vee does an amazing job of hosting thousands of triathletes; both the age groupers and professionals. Hy-Vee hosted the elite athletes at the Embassy Suites, which is a perfect location for race day as it’s located on the run course. The Embassy Suites also has huge rooms, great breakfasts, and is one of my favorite hotels. I had many friends and family members supporting me this weekend. My brother and my dad competed in the age group triathlon Sunday morning. It was inspiring to see all the racers outside the hotel hours prior to my race start. Sunday morning was a perfect temperature for the age group triathletes, but once the sun appeared mid day, temperatures heated up. Due to the draught in Iowa, the swim location was moved to Gray’s Lake verses the river like last year. After dropping my shoes off at T2 around noon, I headed for the 15 min easy bike down to T1 for transition set up and swim start. My main goal before the race was to stay as cool as possible. I loaded my suit with ice before swim warm-up and continued to keep ice on my body until just minutes until the gun went off. Hy-Vee Triathlon does a great job with introductions. All 30 women march down to the swim start with an elementary school student holding each athletes country flag. The moment my name was announced, I stepped on something sharp. Realizing I could not take another step, I had to stop and pull out a bur. Not sure what it was, but I figured I would not feel a thing with all the race adrenaline pumping through me once the race began. 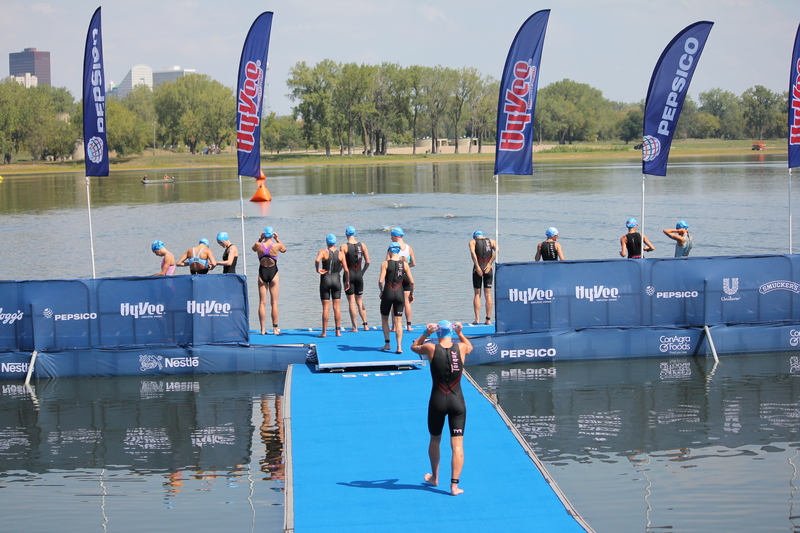 Many pros analyze where to start on the pontoon for the swim. I always aim for clear water, if I have the possibility. This time, most athletes in front on me (four) went left on the pontoon. I took the end spot on the far right of the pontoon. As it turned out, this was a great position. I started the swim strong, but well aware of what was going on around me. About 150 meters into the swim, I moved over to swim behind Lauren Brandon. I noticed Lauren was aiming just slightly to the right of the first buoy, so I went on my own, heading straight on for the buoy. Lauren and I swam side by side for the next 400 meters as we were both thinking about that swim prime. I figured if I wanted that first $5150, I needed to earn it outright. I was swimming hard, but not too hard in that I could not hold that current pace for the entire 1500. With 150 meters to go, I noticed Lauren fell off the pace and I was able to earn the first prime. The second lap, I noticed I had a gap, so I continued to keep the tempo up and exited with a 30 second gap. The transition up to the bike, I was already feeling the heat. I knew I had to get on the bike and go! I headed towards the hilly, technical, four lap bike and prepared for a hard ride! My first sip of the fluid was hot, but that was just the beginning of the heat! Throughout the ride I maintained a lead of 20-35 seconds over a pack of 5-7 women over the course of the race. With 20 minutes left to go on the bike, I had only one sip of fluid left in my bottle. I was parched. All my brain was thinking about the last lap was how thirsty I was. I told myself I just have to keep focusing on pushing the turns and not losing my mental focus. I exited T2 and earned my sixth prime of the day! 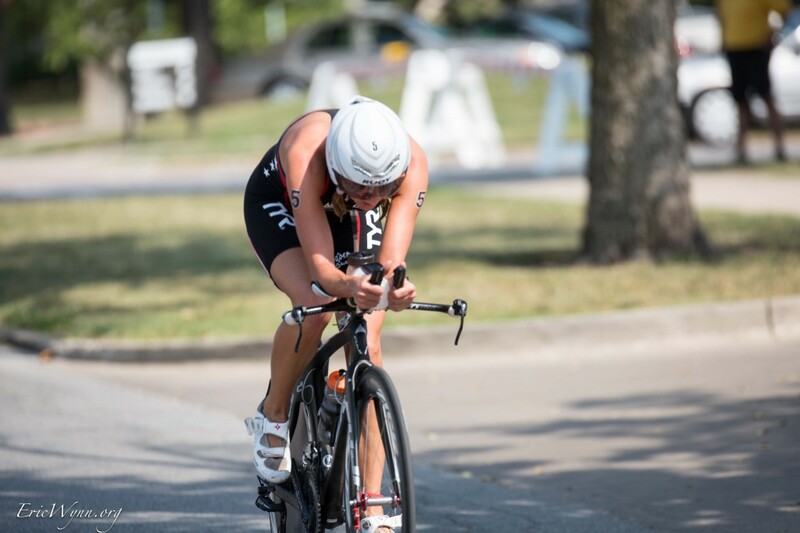 However, Lisa Norden was only 16 seconds behind me leaving T2 and that sixth prime was my last! I started off the run conservative. With the heat, I did not want to take any chances of overheating and not being able to finish. The first water station was about 1000 meters into the run and nothing has ever felt or tasted as good as that first water stop. Once I was able to pour water on me, I felt a little extra surge of energy. I was much more uncomfortable on the bike with the heat than the run. Lisa caught me towards the end of the first lap and I surged to keep up with her throughout the second lap. Towards the end of the second lap, Nate mentioned that some of the other women were running fast from behind. Lisa surged and I was unable to stick with her on the hill. From this point on, I knew I still had 6k left of the run and I wanted to be able to finish strong. Competing in this heat, crazy things can happen. I continued to cool myself with water on every aid station and focused on my form. With one lap to go, I had a 1:15 lead up on the third athlete. I saw Lisa about 40 seconds up the road and once I got up to the last climb, I enjoyed the last 100 meters to the finish. (Well, as much as you can enjoy when you are pretty much spent!). The crowd was so amazing the entire race and I was so grateful for all the support from my friends, family and the city of Des Moines. This race was one of my main focuses for the season. I knew it was going to be a challenging race and was one of the toughest races yet. 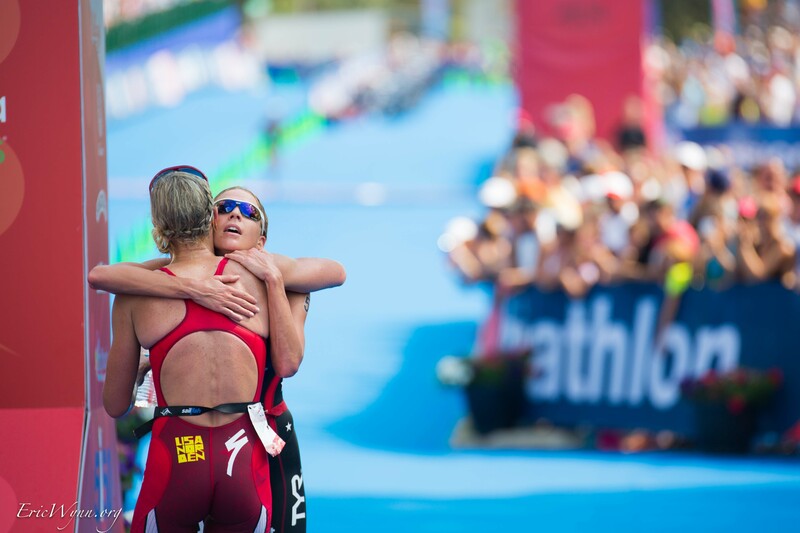 I was proud to share the podium with so many amazing athletes. 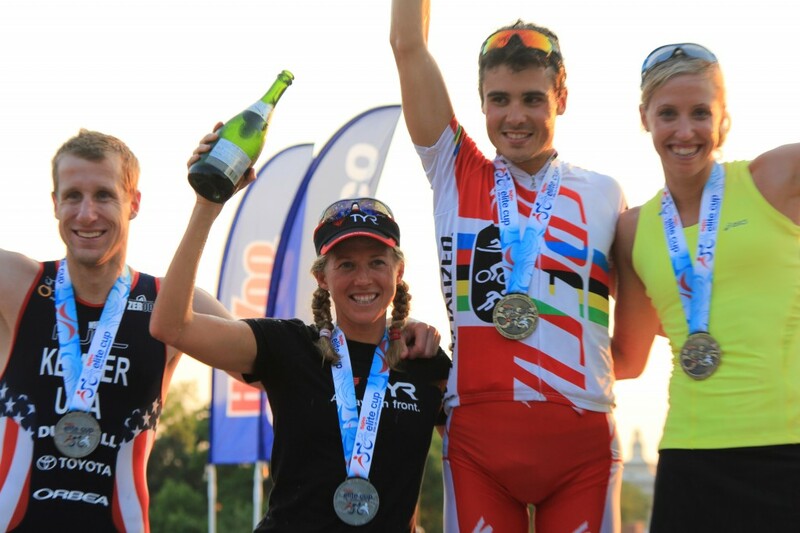 I am a little disappointed I did not break the tape, as I went into this race with the goal of the win. However, I have to ask myself did I give it my all, both in the race and months of preparation leading into the race? Yes, I can honestly say that I did. I will continue to work hard and steadily work towards accomplishing future goals. It is amazing that Hy-Vee has opened up these opportunities for professional athletes. I earned the most prize money in the history of my career yesterday and feel so blessed to be doing what I love. One of the most memorable moments of the weekend, was my signing at Scheels with Advanced Sports and Fuji Bikes. This was the first time I saw significantly more young girl triathletes verses boys. It was so touching to see having this race in Des Moines help to inspire little girls to get involved in a healthy, competitive lifestyle. I am proud to be a role model for the little girls.